Marina was born in Athens, Greece. She studied graphic design, draw and painting. She works on clay since 1997. 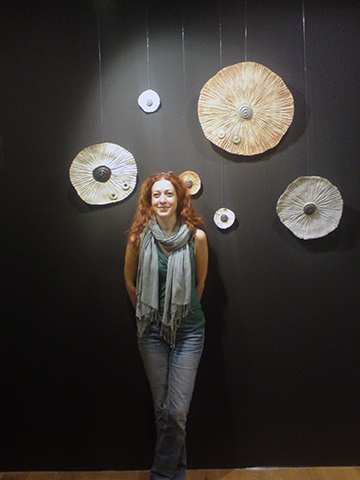 She has graduated from the ceramic art school of Nikaia in Athens and also participated in many seminars and workshops. Since 2003, she has her own studio of contemporary ceramics in Athens and collaborates with various art shops and galleries. In 2009 she won the 3rd award in the 48th Greece competition of ceramic art, with her work ‘Exit’. In 2011 she and Giannis Vlantonopoulos created the 1260ºCeramicstudio in Santorini. “ My work is a constant endeavor to express myself through the most malleable and primitive material, the clay. In my work, one can distinguish two different tendencies. The first is the distinct sense of the object’s shaping procedure which allows the person who views it or touches it, to feel how it was made. The second is the dynamic forms which characterized by clear and imposing lines that penetrate the air and establish themselves in space. I work with stoneware clays as these provide me with the opportunity to color and create unique maniera by making glazes from porcelain and olive tree ash as the main ingredients and fire them in 1260°C (2300°F).